Beyond Frustrated ..... Why does adding underlay changes the top fill ???? 6 months 2 days ago	- 6 months 2 days ago	#459 by Pascale R.
Beyond Frustrated ..... Why does adding underlay changes the top fill ???? was created by Pascale R.
I am so frustrated. Something simple should be easy to do. 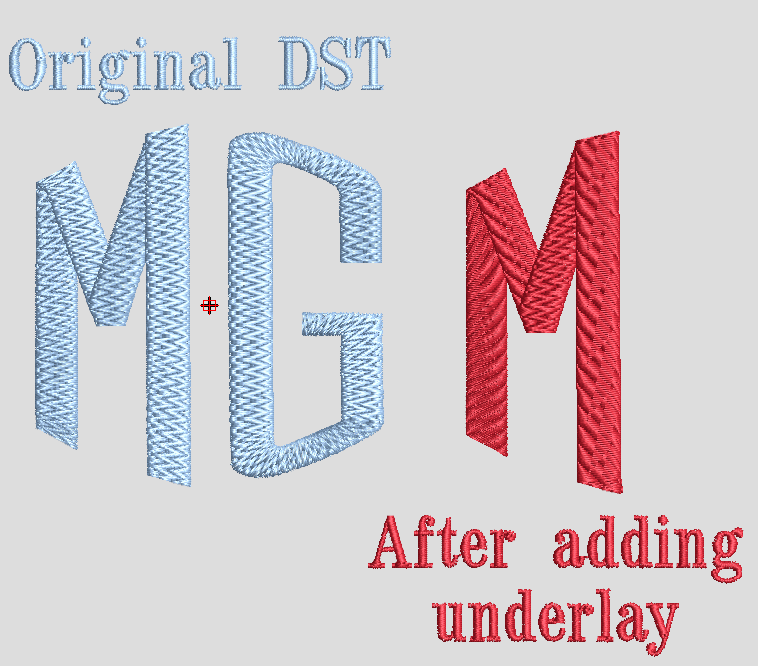 I import (or open) a DST file of a monogram. This is font with special fill created in PersonalizeNStitch and saved as DST. I can digitize object to create my own underlay, but WHY do I have so many problems? Wilcom is great for digitizing; but editing existing sewing format files is really proving to be a challenge for me! This is so frustrating! Replied by vitordigitizing on topic Beyond Frustrated ..... Why does adding underlay changes the top fill ???? That is normal, and happens on any software, try buy files from people can offer the EMB version too. Replied by Alex on topic Beyond Frustrated ..... Why does adding underlay changes the top fill ???? Hi Pascale, Please check that the files are attached and we will investigate. Thanks. Replied by Sam on topic Beyond Frustrated ..... Why does adding underlay changes the top fill ???? That is the limitation of object/outline recognition when opening a design file from a stitch file. Wilcom software is trying to restore object properties, but it is impossible to restore a stitch file to its original EMB file, especially for the pattern fill. In your case, when you applied an underlay to the recognized object, the stitches will be re-calculated for it according to its Object Properties. Since the pattern fill was recognized wrongly, the outcome of the re-calculation is not what it should be. 5 months 3 weeks ago	#487 by Pascale R.
Replied by Pascale R. on topic Beyond Frustrated ..... Why does adding underlay changes the top fill ???? Thank you Sam, Alex and Luiz for the explanation. I'm disappointed there is no magic wand to fix this, but the explanation makes sense. It also answers another problem I've had (why resizing a non-emb design can affect stitch generation/patterns).